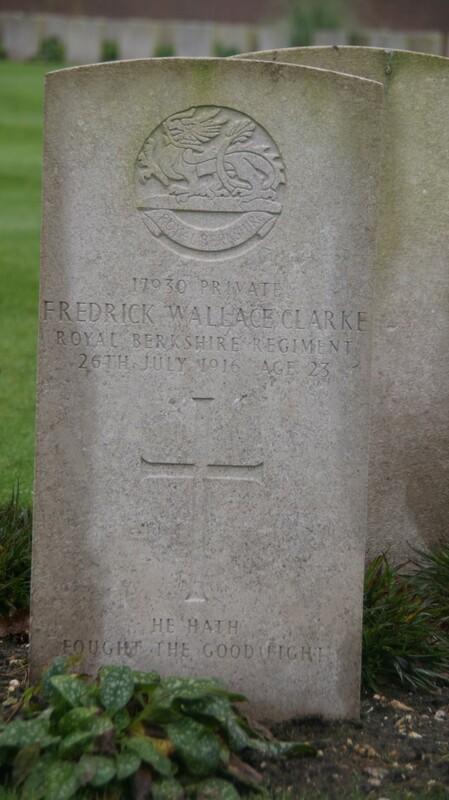 Private 17930 Frederick Wallace Clarke, 8th (Service) Battalion, Royal Berkshire Regiment. Frederick was born in Whitchurch, Hampshire, in 1893. He was the son of James Clarke and his wife Mary Ann née Baker who had six children, but only four survived to be recorded in the 1911 census: Blanche Mary (born 1889), Ethel (1891), Frederick and Arthur George (1901). Another boy, George Henry (1888) died aged 5, but the sixth child has not been identified. In 1898 or 1899 James moved the family to Newbury, where he had found work as a coachman (a step up from the groom job he had in Whitchurch) – the family lived at 8 Albert Terrace, Albert Road. In 1907 they moved again, to a brand new house: 4 Heathfield Terrace (now No 39), Mill Lane. However, his employment was, once again, as a groom. Living in Albert Terrace the most convenient school was in Speenhamland a few hundred yards from their home. Here Frederick would have received a basic education before starting work at the age of 14. He found a job as an errand boy for the Star Tea Company at 87 Northbrook Street; he progressed to become a shop assistant and stayed with the company after it closed its Newbury branch in 1909. He worked in several branches until, in May 1915, he was working at their shop in Chard, Somerset. Several months into the war the pressure on young men to join up was ever increasing; Frederick went to Taunton where he enlisted into the Royal Berkshire Regiment. He was posted to one of the regiment’s training/reserve battalions, the 3rd Battalion where he would underwent basic training in preparation for deployment to a battalion in the field. His chance came later that year and he landed in France on 30 October. He may have been among a draft of 77 NCOs and men from the 3rd and 9th Battalions which arrived to join the 8th Battalion on 31 October, but it is unlikely that his journey from the coast to the front would have been so rapid. However, it was 19 December before the battalion’s war diary records another draft of replacements – which seems a long time for Frederick to be waiting at an IBD (Infantry Base Depot) for a posting to an operational unit. Nevertheless is seems certain that he was with the battalion by Christmas 1915. The ensuing months were relatively quiet for the 8th Battalion, until it was transferred from the Ypres salient down to the Somme in July 1916, a journey that takes an hour or two by car these days took the battalion 3 days. They arrived in Albert at around midnight 8/9 July and went into the trenches near Lozenge Wood on the 10th. From that point they were regularly in action, taking part in a number of actions in which they took casualties. CLARKE – July 26, Pte F W Clarke, 8th Royal Berks, son of Mr and Mrs J Clarke of 4, Heathfield Terrace, Mill Lane, died in Rouen Hospital from wounds received in action, aged 23 years. – “Deeply mourned”. Information is to hand as to the manner in which Pte F W Clarke, of the 2nd Royal Berks Regiment, son of Mr and Mrs J Clarke, of Mill-lane, Newbury, met his death. Since receiving the official notification, a letter has reached them from a comrade, who tells how the deceased soldier met his death by taking the place of a chum, who was a married man. The letter stated they were engaged in bombing the Germans in the from trenches on July 26th, and Pte Clarke pushed his chum, Pte Archie Palmer, of Benham, on one side, telling him that he had a wife and family to look after, while he had not. There is no doubt that this noble act of self-sacrifice save the life of Pte Palmer, as while the deceased was in the act of throwing bombs, he received a bullet wound in the abdomen, from with he never recovered, passing away in the Rouen Hospital. The parents have also received a letter from the Rev W E Harper, CE Chaplain at the hospital, who stated that their son’s end was quite peaceful, as he was unconscious for some time before he died. Pte Clarke was 23 years of age, and after leaving school, worked as errand boy at the Star Tea Company’s branch in Newbury. By diligence he worked his way up to assistant, and had been transferred to several branches in different towns, being at Chard in Somerset, in May of last year when he joined up at Taunton in the 2nd Royal Berks. He performed his training with the third battalion at Portsmouth and Fareham, going out to the front in October last. The deceased had been continuously engaged since then, and his parents received his last letter on July 26th, the day on which he died, telling of having been wounded, and that he was in hospital, but that they were not to worry. The newspaper account of the circumstances of his death does not ring true (to be fair they rarely do). He died in a base hospital, miles from the front line. To reach Rouen he would have been treated first at a dressing station then transported to a casualty clearing station before being sent on the larger hospital. During this process he wrote a letter home before lapsing into unconsciousness and dying. It is unlikely that this took place all on the same day. On 22 July 1916 the battalion moved into the line once more, not to carry out an assault, just a routine changeover as its Division (the 8th) took over a sector of the front where many Berkshire lives had been lost the previous September/October during the Battle of Loos. The 2nd Royal Berks were the rightmost unit of 8th Division, holding the line to the south of the Germans in the Hohenzollern Redoubt. 22 July In divisional reserve billets at La Bourse [Sailly Labourse]. The Battalion proceeded to trenches. Right sub-section, right section and relieved the 7th Cameron Highlanders about 2pm. Flank Battalions 6th Royal Irish Fusilers on right flank, 2nd Lincolnshire Regt on left flank. 25 July In trenches. Right sub-section, right section. Flank Battalions – 6th Royal Irish Fusilers on right flank, 2nd Lincolnshire Regt on left flank. Lieut G W Lindley to hospital, 2 men to hospital. 26 July In trenches. Right sub-section, right section. The Battalion was relieved by the 1st Royal Irish Rifles about 11am and proceeded to Brigade Reserve Trenches. 1 man to hospital, 2 men wounded. 25 July Far more active day. Our Reserve Line & Quarry heavily shelled. Our Trench Mortarts, Rifle Grenades, Mills throwers and Artillery kept up a retaliation on the enemy all day. Enemy sniping our loop-hole plates with a sort of pom-pom. A good deal of work had to be done to damaged trenches on our left. Lieut Bond, Inns of Court, attached for instruction. Casualties 3 killed 2 wounded. Our Stokes appear to greatly annoy the enemy. This describes the sort of day that could fit with the newspaper account of Frederick’s wounding – shot while throwing grenades (Mills bombs). Grenades could not be thrown far; they were close quarters weapons, most often used when contesting the possession of a trench – either capturing an enemy trench of defending against a German attack. Sadly his self-sacrifice did not mean that his mate, Archie Palmer, came home to provide for his family; he died during the German spring offensive on 21 March 1918 while still serving with the 8th Battalion, Royal Berks. 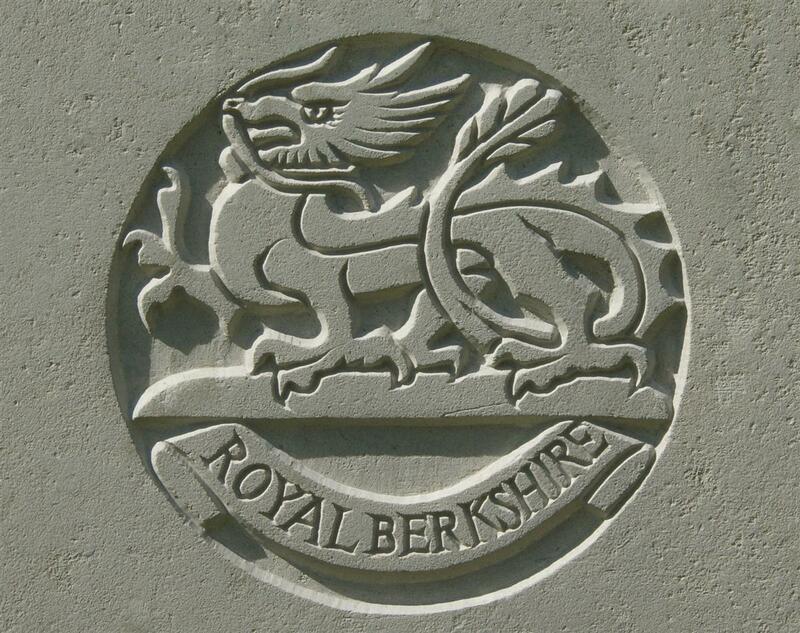 In ever loving memory of Pte F W Clarke, Royal Berks Regt, who died on 26th July, 1916, of wounds received in action. Buried in Rouen. A grave we shall never see. 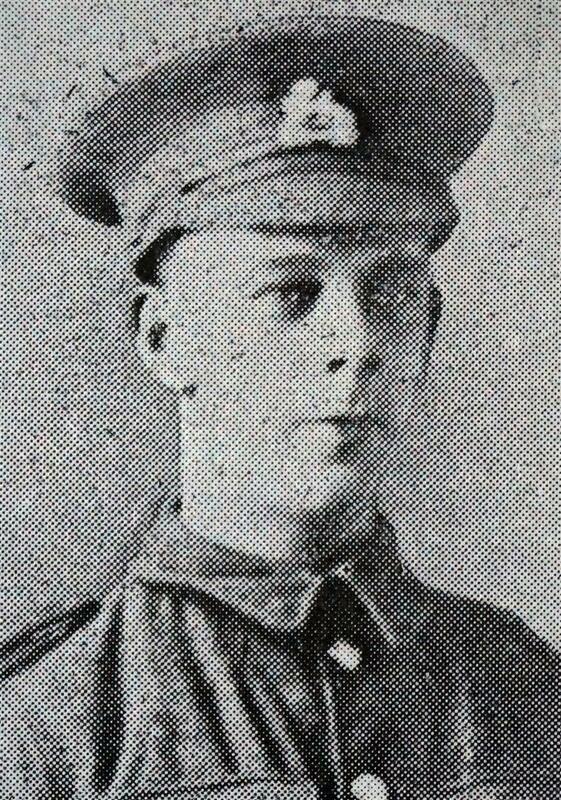 In loving memory of Pte F W Clarke, who died of wounds received in action on the Somme, July 26th, 1916. He has crossed the Bar, to the great beyond. And went to the noblest King of Kings. From his sorrowing Mother, Father, Sisters and Brother. In 1922 his name was included (on tablet 11) when the Newbury Town War Memorial was unveiled; he is also remembered on the memorial board and roll of honour in St Nicolas Church, Newbury. He was also commemorated on the Speenhamland School Memorial - this memorial has been lost so it is not possible to confirm that his name was given incorrectly as Frederick Walter Clarke – as reported in the newspaper coverage of the memorial’s dedication ceremony.